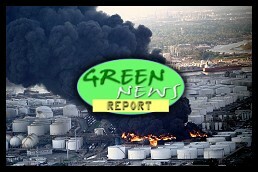 " 'Green News Report' - March 21, 2019	"
U.S. District Judge Rudolph Contreras in Washington appeared to go a step further than other judges in his order issued late Tuesday. Previous rulings focused on individual lease sales or permits. But Contreras said that when the U.S. Bureau of Land Management auctions public lands for oil and gas leasing, officials must consider emissions from past, present and foreseeable future oil and gas leases nationwide. Federal oil, gas and coal leasing — both on land and offshore — accounts for a quarter of America’s total carbon output, according to a report issued last year by the Interior Department’s U.S. Geological Survey. Oil and gas drilling accounts for about 40 percent, or 500 million metric tons, of that total...Although BLM would be required to disclose the overall climate impact of its leasing decisions, it could still go ahead and open those lands up for development. By Thursday morning, benzene had escaped through the foam blanket covering the tanks at the facility, according to the Harris County Fire Marshal Laurie Christensen. She said vapors could be released as the foam separates over the next 24 hours. The Texas Environmental Protection Agency said Wednesday that benzene levels near the facility didn't pose a health concern. These floods are, in parts of Nebraska in particular, worse than longtime residents have experienced and in many cases are downright unprecedented in historical records. The federal government’s own climate assessment last year concluded climate change caused by oil, gas and coal emissions already is hitting the United States. Weather extremes such as flooding, hurricanes and drought “have already become more frequent, intense, widespread or of long duration,” the report, compiled by scientists at EPA and other federal agencies, said....They “are the largest and most immediate environmental and public health issues affecting the world right now,” [Wheeler] said..
« PREVIOUS STORY "FL Republicans Undermining New Constitutional Amendment Granting Voting Rights to Ex-Felons: 'BradCast' 3/20/2019"
"'Green News Report' - March 21, 2019"
We are reacting as usual, rather than being proactive with vision (The Gravity of Sea Level Change - 5).